Whenever summer rolls in, I get more and more allergic to the thought of sleeves and basically anything long. Aside from obvious reasons based on fashion trends, it’s just more comfortable and practical to wear less cloth. LOL! The heat can get unbearable especially here in our country! The only things welcome in my summer wardrobe are sundresses, tank tops, shorts and skirts. Good thing, summer wear is cute! Instead of moping about the weather, I choose to make the most out of the clear blue skies and tropical weather. I’m sure most of you are doing the same thing. Only summer wear can achieve this carefree and bright appeal. You have to be cautious though. I know a lot of you love showing off your skin during this time of the year like me. But doing so means exposing your skin to the sun’s rays which is the major cause of premature aging, skin darkening and dryness. So what’s a girl to do? No need to hide underneath the shade of your umbrella. All you need is the right tool to care for your skin. Luckily, Vaseline Healthy White SPF24 lotion brings together highly effective features to get ready for the summer sun. Its SPF 24 PA++ protects skin from harmful UVA and UVB rays and is equipped with Vitamin B3 to effectively whiten skin. This is what sets Vaseline apart from the rest. It moisturizes, protects and whitens! No other lotion can do all 3! Time to say goodbye to whitening lotions that do not protect nor moisturize. No more sticky feeling from that thick sunblock lotion you’re used to using. Vaseline Healthy White SPF24 lotion is here to make you summer ready! You’re free to show off your skin with today’s trendy summer fashion. Say hello to a summer of mini skirts, short shorts, tanks and sundresses! And to show you just how much Vaseline wants you to enjoy your summer this year, Vaseline cooked up a special promo for you! 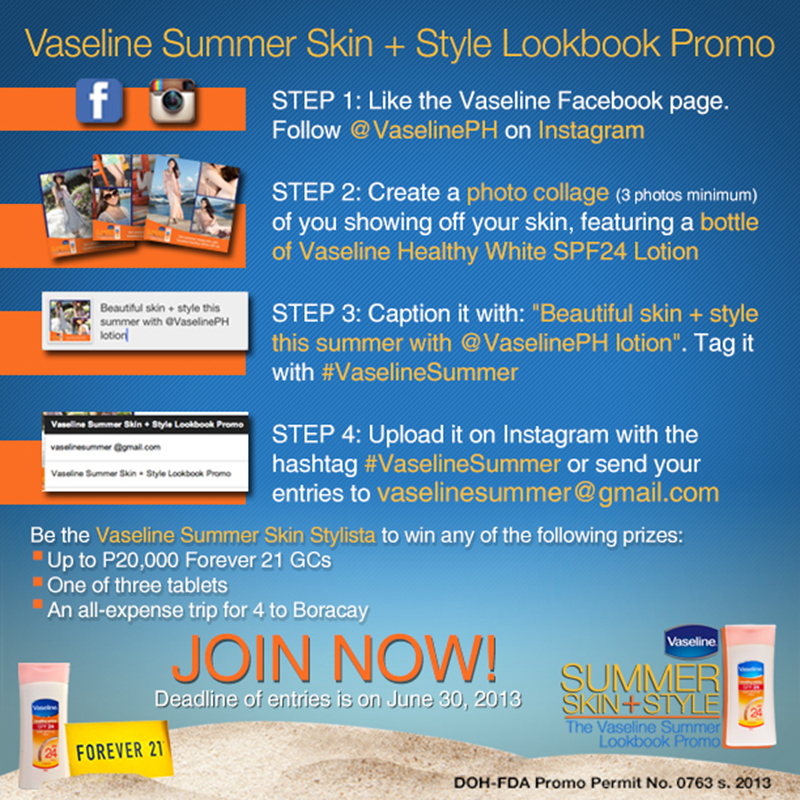 Join the SUMMER SKIN + STYLE: The Vaseline Lookbook Promo by sharing your prettiest summer fashion looks to Vaseline and get a chance to win amazing prizes such as iPad Minis, Forever 21 Gift Certificates and a Boracay Getaway Trip for 4! Visit the Vaseline Facebook Page for more details and follow @VaselinePH on Instagram. Still need a little push? Here are 2 outfits of mine that can serve as sample entries. Piece of cake, right? No more hiding from the sun! Walk out in confidence with your soft, fair and well-protected skin by Vaseline Healthy White SPF24! Haha! Cute nga yun eh! Hey miss Camille! I really like your style ♡ I just want to ask tips on what to wear for a luau party? I don’t wanna dress up all flowery cause I know everyone would be wearing that. I want to look unique but at the same time I ‘d still be able to blend in. Response highly appreciated! Thanks! Thanks Isa! :) F21 has everything! Really! Wear them! Perfect for summer! Awww thanks Tricia! :) Ang sweet mo naman haha! I mean my view is that some asians look better when tanned and some look better pale, but is this a cultural thing? mga maputi lang kukunin nila. OMG! i was looking all over feetforaqueen.com.ph what shoes are those?? i want to get them for my kuya’s wedding next month! Haha! Kung maka-chismis! :) Vaseline lang yan haha! Thanks Kathleen! Good luck! Hi again Camille, any idea kung anong age range ng contest na to? Because my 11-yr.old niece wants to join eh, pwede sya? Ohhh to be sure, all the info is on the link I posted :) Para sure na sure! The length of your hair in curls suits you!! You should try Olivia Palermo’s LOB(Long Bob)! I just might! :) Thanks Pat! LOL! Hot from all the sweat? Thanks Ajoy! Bongga! Meron ka ng Lotion endorsement! Camay, Pantene, and Vaseline! Feeling ko feminine wash na ang next! For sure may hinahangin-skirt na ganap ang post mo dyan if ever haha! O kaya facial wash ang next endorsement mo! Cetaphil siguro yan o kaya Pond’s! Ay! Shucks! Hmmmm let me think. It would probably be a pair of Keds? Canvas sneakers! Why? Think of it as a metaphor. Canvas shoes are comfortable and versatile. As a blogger, be comfortable in your own skin as you try to push your limits and experiment with different styles. Along the way, you’re bound to commit mistakes but like canvas sneaks, you can always wash them after and start anew with the knowledge and experience you get from learning from your mistakes. Dapat! Always try your best in everything motto ko LOL! This is the “shoot” you mean with your Blog titled “Double Denim” Ms. Camille right? :) very beautiful. hi camille…. I sooooo love the outfit.. anyway, I wanna follow you on twitter if you dont mind..what’s your twitter account?heheheheh! and btw, the shoes is to die for!!! oh i love it! I really like how your hair looks in these shots! A girl like you is ready for all seasons :) Always beautiful! I love the flower crown, makes this outfit so girly and romantic! love the top and flower crown! P.S. Your legs are flawless! The shorts look like skorts and I’m digging those kinds lately. Been visiting your blog forever for inspiration. Belated Happy Birthday Camille! Just like you I was also born during summer and I find really cool! You look beautiful! Love the top and the shorts! Kisses! Haha mas lalo na! I’m not up to par! Falsies :) Thanks Sephie! I know what you mean! I’m no beauty pageant level! Haha! Thanks Dan! Oh My! such a cutie! the curls! i ♥!